A few of the tools you'll need to get your shoes real shiny. If you've got a nice pair of dress shoes or designer heels that you invested half a paycheck on, you want your footwear to last. The problem is that even the most well-constructed shoes wear down quickly with rigorous daily usage. Pretty soon, the heels of your Prada lace-ups are worn down, the tips of your Jimmy Choos are scuffed, and the shiny leather on your favourite Balenciaga knee-high boots have lost their luster. So what's a fashionable-baller-on-a-budget to do? The same thing you would do with anything else of value you own: preventative maintenance and upkeep. - Shoe polish. You want the kind in a metal tin. Beware of liquid polishes because they dry the leather of your shoes. Make sure the polish matches your shoe color! If you use a standard brown and your shoes are a lighter shade, it WILL change the color, so keep this in mind. - Polish-applying brush. This is the little brush with a circular patch of fibers. - Buffing brush. This brush is large and rectangular. Get a nice one that has soft fibers that won't scratch your shoes. - A clean rag. Either the store-bought kind or an old cotton t-shirt will do. 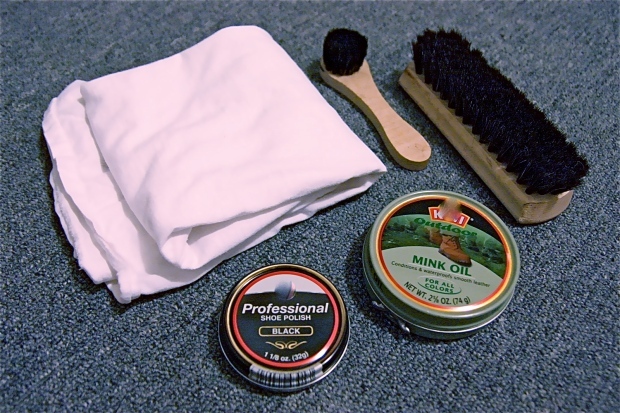 - Mink oil. This is optional, but it's good for making sure the leather doesn't get too dry. 1. Dust off your shoes with the buffing brush. Remove any debris, and use a slightly damp cloth to spot clean any very dirty spots. Dry the shoes off immediately with the clean rag. 2. Use circular motions to place a conservative amount of polish all over your shoes with the applying brush. Let it dry for 15 minutes. Expect your shoes to get a little darker, because you are essentially adding a coating of material to the leather of your shoe. You also want to be careful if your shoes have different coloured areas and be careful not to discolour the various sections. 3. Even out the shine with the big brush and buff your shoes to a gleaming shine with the clean rag. This may take some physical exertion on your part. Now if all this sounds far too laborious for you, you could take your shoes in to a professional cobbler. You definitely need to see a professional when the time comes to replace a worn down heel or repair minor damages. Just like the brakes on your car, you want to take it in before the damages reaches to far. For men and women with formal shoes, boots, and heels, they can apply rubber traction soles to the bottom that will not only prolong the life of your shoe, but also provide far better traction and keep you from slipping and sliding on smooth surfaces. This is invaluable, since many men's dress shoes and most women's shoes in general lack any kind of traction. Cobblers usually charge separately for the heel and the front sole. Take good care of your precious footwear so that you can expand your shoe collection with the money you save! JT Paradox is a photographer and writer for TheSFStyle.com. He can often be found with camera in hand, roaming the streets of San Francisco. Fan letters and hate mail should be directed to theJTparadox@gmail.com.